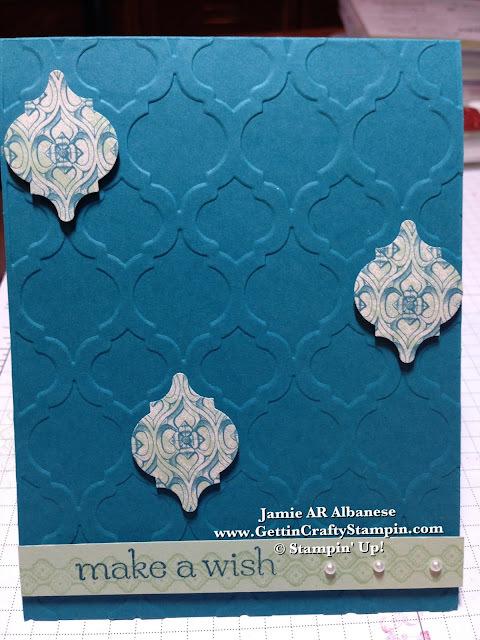 Victorian Window... Ornament... this is the description of this beautiful new Venetian Romance (#130144) Designer Series Paper. With Trendy but Vintage Colors and Patterns.. I took and mixed Mod and this Vintage pattern for a cool look. Island Indigo card stock (#122923) is really a fabulous blue... It inks up this Sweet Essentials* greeting stamp set (#132085) that's *25% OFF until the end of June!! (CLICK HERE to see what is on sale). Our NEW In-Color Pistachio Pudding card stock (#130020) pairs up so well and coordinates with this beautiful Venetian Romance DSP. Subtle stamping tone-on-tone this Mosaic Madness (#130249) Pistachio Pudding ink (#131177) for a coordinated look. Punching this Mosaic shape (#131267) that mimics the Venetian Pattern. 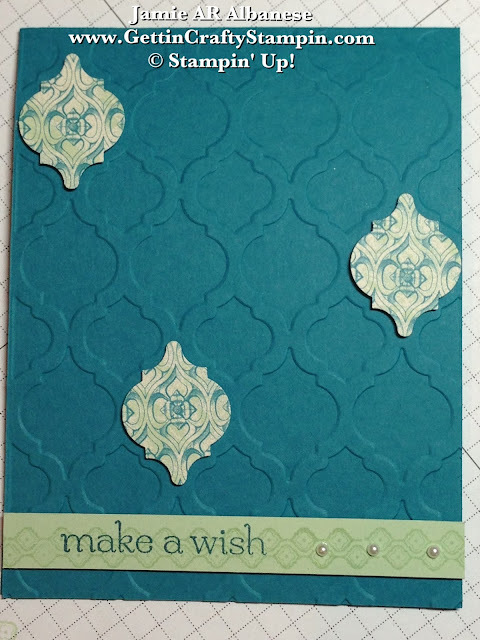 Pearl Basic Jewels (#119247) adds a dash (or three) of richness to this elegant paper and Embossed card stock. I love that our Big Shot (#113439) and the Modern Mosaic (#129984) embossing folder create this pattern on pattern look. CLICK HERE to see the New Catalog and FULL Line of Stamps, Papers, Inks, Accessories, Tools.. Make Impressive Cards and Projects with ease.. they all coordinate and are fun to use! Leave me a comment and let me know what YOU Think! Please feel free to Share this, Pin It, Facebook and Tweet Me and My Cards.... I'd be blessed by this.